Not a week goes by where something exciting doesn’t happen to me. You might think it is exhausting (I believe this is my owner’s opinion), but I love it! Last week was an especially big one for me. You’ll recall that my Russian stalker, Rezoner, visited. Well, Rezoner wrote a (hopefully) nice post about our meeting. Only it’s in Russian. I have a lot of Russian-speaking fans so if one or more of you could read it and leave a comment here about whether it is nice or not, I would appreciate it. Only I’m sure it is because Rezoner loved me so why would he not write something nice? I also got to meet a local stalker Bob Cooksey. Bob posted this video of our meeting. Check it out and leave Bob a comment. He’s only gotten two as of this writing and that video surely deserves more. But that was last week so let’s get to the new news. This week I did two school visits. Monday I went to the San Marcos Montessori School in San Marcos, Texas. In this visit I met about 30 students, mostly pre-school but some 1st and 2nd graders since Monday was a holiday for a lot of folks. Gosh I had a good time! The kids sat around me in a circle and were very well mannered about taking turns asking questions and petting me. I have to say, I wish adults were always so well behaved! The preschool has a pet guinea pig named Sugar and they brought her out to meet me. She is absolutely the cutest thing ever (next to me). After a bit of nose-sniffing, we were like best buds. That is until I stepped on her! 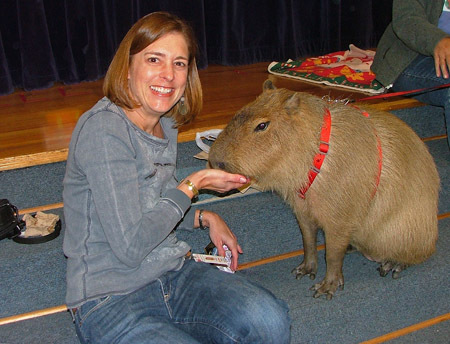 I think guinea pigs can squeak even louder than capybaras because you should have heard the noise Sugar made! I didn’t know what was going on and my owner had to pull my paw off of Sugar. I can’t tell you how embarrassed and worried I was. But a few days later we got an email from the school and Sugar is fine. Whew! Friday I went to Hill Elementary School. Outside the school I met up with my Houston stalker, Jeff Djayasaputra. You can see me with him in the photo above. I guess I could have been friendlier but I really wanted to explore my surroundings. It’s not every day that I go so far north; I wanted to see if there was any of that white stuff called “snow” up there. For better or worse, I didn’t find any. JJeff is a graphic artist and he brought a gift for me. Look at this wonderful capybara quadrille he created! Isn’t that great? 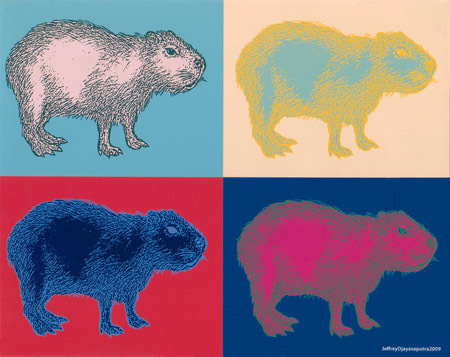 I wish capybaras really came in all those colors. 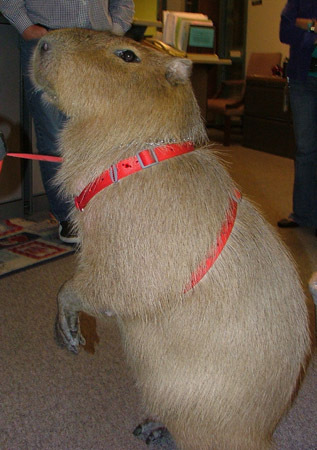 One of the dumb things Sheldon always says is that all capybaras look alike except he can always tell a photo of me. Even so, we were surprised that looking at Jeff’s work, we could tell he didn’t model it on me. Turns out he used a photo of a Japanese capybara. I’m going to take credit for being his inspiration anyway. 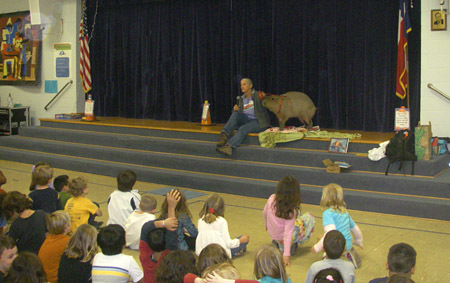 Then my owner and I gave a presentation to the entire first grade. Zowie! About one hundred kids all in one room. But the teachers, especially Jill Clark who invited us and organized the whole thing, kept the kids neatly seated in rows on the floor in front of me and they (generally) very politely raised their hands to ask or answer questions. I must say, I loved those kids. They totally got my sense of humor. 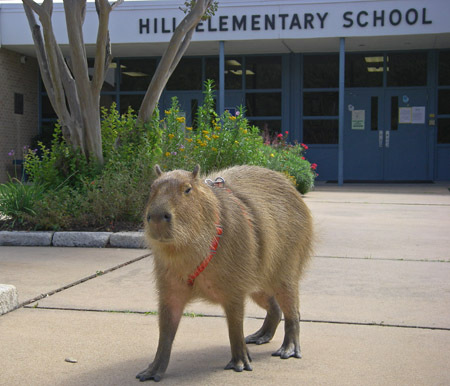 And they already knew a lot about capybaras and rodents in general because their teachers had been covering us that week in school. This video shows the first few minutes of the presentation. The kids loved seeing Ms. Clark feed me some frozen blueberries. And I thought they were going to explode when I did my “stand” trick for a piece of pear from my owner! Is there no limit to my cuteness? 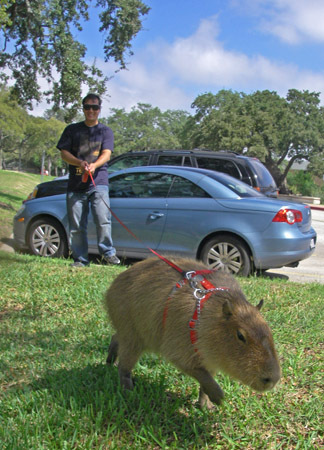 As I’ve often said (or, more acurrately, as I plan on saying often), being the world’s most famous capybara is a the hardest job I’ll ever love! Capin, OF COURSE it’s a very nice post! I know your Russian is not good, but you can see the pictures! Caplin, sweetie, will you ever come to the UK? As always Caplin you are so great..you really represent the capys all over the world.Loved your blog and everyone should read the stories..they are great. Caplin, you command the stage like a pro! Very professorial. Someday you’ll have to come to UC Berkeley to chair the country’s first Dept. of Yogurt Studies. I find it odd you refer to yourself as Caplin’s “Owner”. but it denotes a Master-Slave relationship. And Caplin is a free person. I think “Mother” or “Big Sister” is more appropriate.